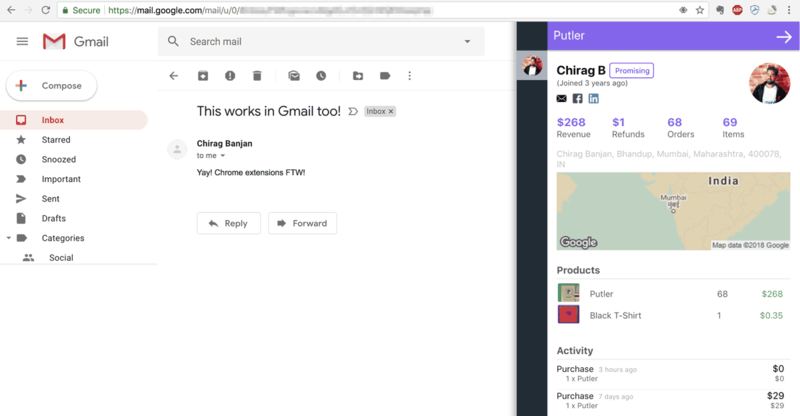 Putler’s new Chrome extension shows complete customer profile and order history anywhere on the web – in Gmail, your help desk, CRM, email marketing system… whatever you use. Howdy! Have you experienced this? I have a strong hunch you have witnessed something similar, but let’s see. Meet Jackie. She sent a rather irate email complaining that our WordPress plugin crashed her site. That her business is on line and we must fix it urgently. Akash quickly picks up on the case and starts digging deeper. He asks Jackie to perform a few tests to diagnose actual problem. But she insists it’s our plugin that caused the problems and that we fix it – else she will leave bad reviews everywhere. While we don’t like threats like this, our commitment is to solve the problem for the customer. So Akash requested access to Jackie’s server. He logs on to the server. Our plugin seems to be working well. He goes through everything else and discovers that another plugin is at the root of the problem. Removes that and the site is back to normal again. During his analysis, he also finds that Jackie has not registered her product and asks Jackie to confirm her order number and license key. What just happened? Akash spent five hours solving a problem that was not due to our product, for someone who wasn’t even a legitimate customer. Now you may or may not have had this kind of an experience. If we can differentiate between customers, potential customers and others, we can be more productive and provide better customer experience. How do we identify whether the person behind an email address is a customer or not? We can set an auto responder on every incoming support request, and ask for order / purchase information. But that’d bother most customers. We can route all support requests via a form and ask people to enter their order information or at least indicate if they are customer or not. But that increases hurdles in reaching you. What if people want to just send an email? What if you want to consolidate support requests from multiple sources? Or you can ask your support team to first find the customer’s order in your e-commerce system. But you are smarter than that. A helpdesk should pull order information from incoming email. This will let your team clearly see if this is a valid customer, and their order history. If they don’t see any orders, they can ask for purchase information in their first response. If you look beyond this particular case, what’s the overall, big picture, situation? The bigger challenge is that you need to know your customers – at every interaction point. If you get in-depth customer profile in your email / marketing app, you can develop better relationship. 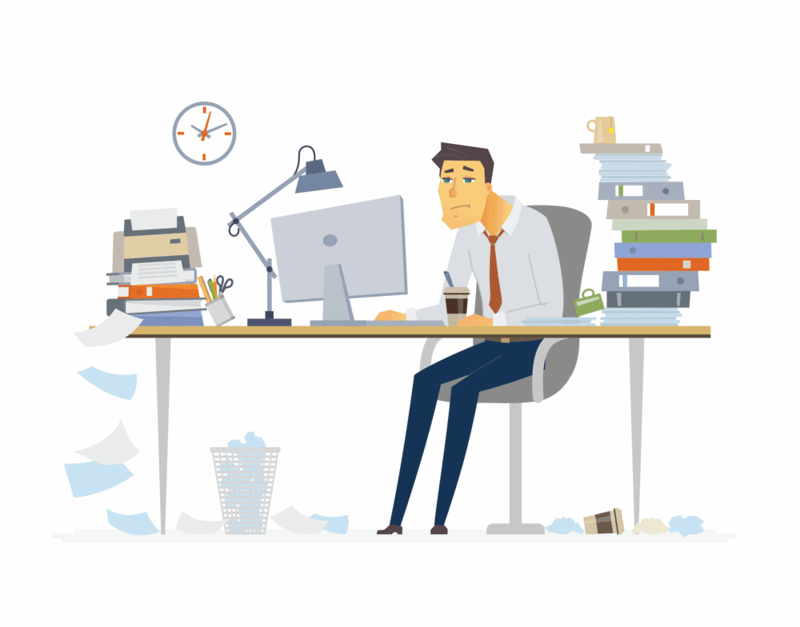 Customer details and order history within a helpdesk will make your team more productive. If you could see key measurements like life time value, orders and refunds within a CRM or anywhere else, you will get a holistic perspective on the customer. If you can figure out who’s behind an email address, you can serve them better. Let’s split it into pieces. You already have your e-commerce system in place. Congratulations! We just solved your problem! We built a Chrome browser extension that detects email addresses on any web page, checks to see if they are your customers, and shows 360 degree view of your relationship with them in a neat sidebar. Interesting.. But why a browser extension? Putler already consolidates data from all popular payment gateways and e-commerce systems. It does all the number crunching and provides useful insights. Additionally, Putler even enriches customer profiles with avatars, social connections and segments them. 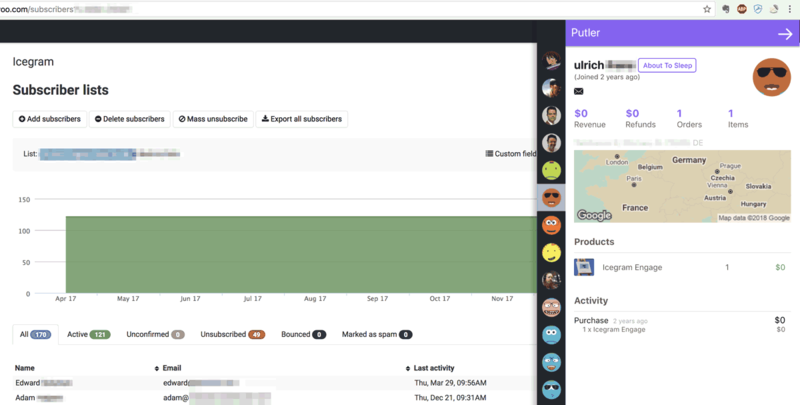 Putler is the meaningful e-commerce analytics tool for growing businesses. It works with all popular payment gateways and ecommerce systems. Supports multiple accounts, multiple currencies… Actually, there is a lot to Putler. Thousands of people like you use it everyday. We started thinking of ways to connect Putler with other systems. Rather than building a solution specific to a helpdesk/CRM system, let’s build something loosely-coupled. Something that works with any website. That way a lot more people can use it. Instant, Zero configuration integration with all your tools! If we build a Chrome browser extension (72.38% Putler users are on Chrome), it can discover all emails on any page. Then match them against Putler database and show customer details just like we show within Putler. This delivers customer information on any page with an email address. Meaning it will work with any helpdesk, CRM, marketing tool, webmail, project management system, invoicing system.. Anything at all. As long as the page has some email address. If a site includes email addresses of customer, Putler Connect can show you complete profile of that customer instantly. No APIs to fight with. No setup to perform. Look up customer’s order history before answering their support question in your helpdesk, webmail or CRM. Find detailed customer profiles in your marketing / mailing list app on a page with a list of subscribers. Turn your e-commerce system or payment gateway in a mini CRM by looking up complete order history, location and social profiles for a transaction. Basically, understand your customer before reaching out to them. Look up customer order history and profile information within Stripe – or another ecommerce system! Using Gmail? Or another webmail? May be a CRM? Putler Connect can make you super productive! 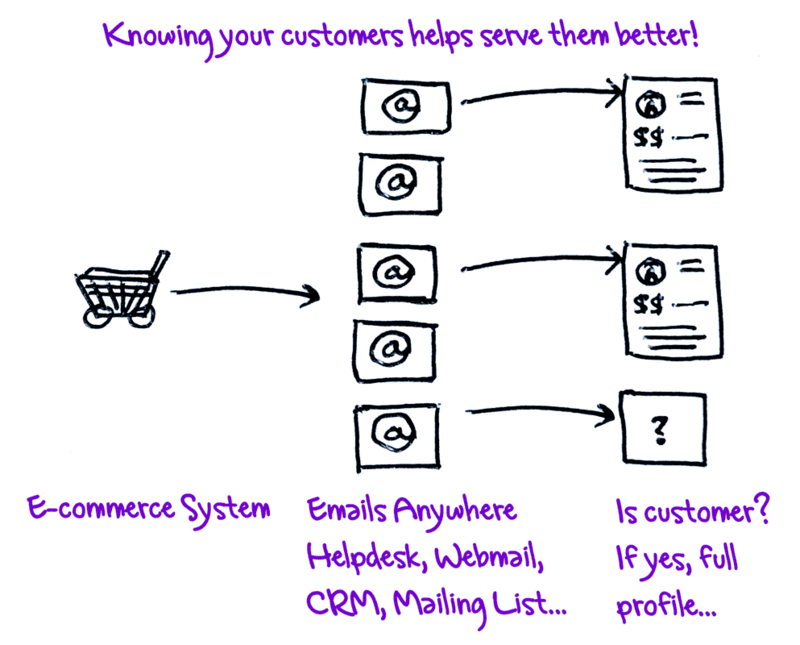 Imagine seeing customer details within an email marketing automation system! I must admit I never thought of this until I started using the extension. You can use the extension within the Putler app. Yeah! 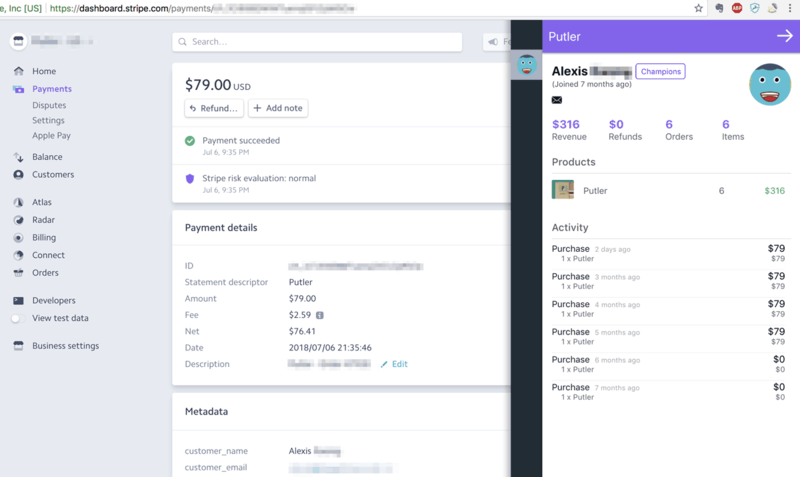 On the Home dashboard or on Products/Customers, you can pull up the Putler Connect sidebar and it will populate profiles of all customers on the page. This means you can view customer history even faster than Putler app, thanks to Putler Connect! Putler Connect can even make Putler better! In this case, I’m viewing profiles of customers for a particular product. Power to your whole team, securely! Putler Connect works for anybody who has a Putler account. 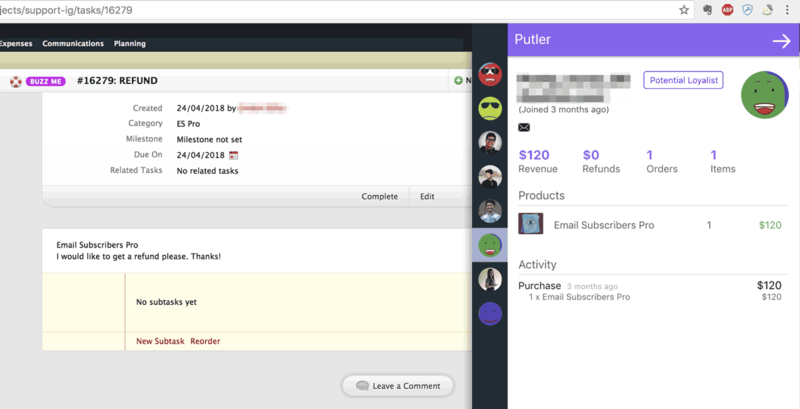 You can use the Team Sharing feature within Putler to bring your team on board with Admin or Support role. People with Support role can only see transactions history and no KPIs. 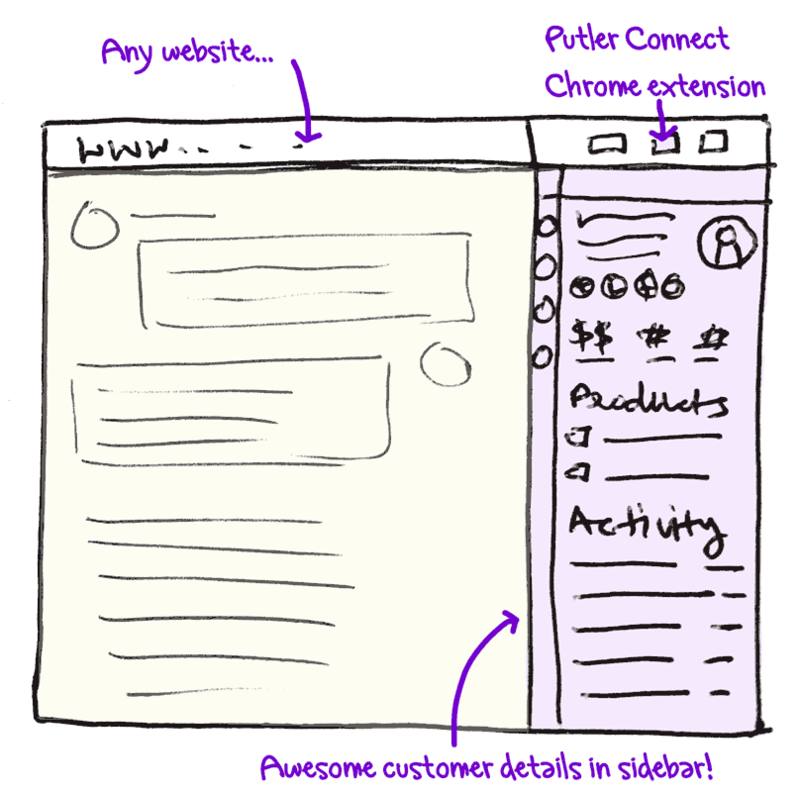 Invite your support / marketing team to Putler. And then install Putler Connect in their Chrome browser. Now they can look up customer history without opening Putler app. They can be within your customer support system or within a CRM. Just click Putler icon in Chrome toolbar to see full profile of any customer. Now that’s some productivity improvement on large scale! People who built it are excited too! Inside story: This quickly became my most frequently used Chrome Extension! I don’t install a lot of Chrome extensions. As a matter of fact, I have only four – Ad Block Plus, Dashlane, Evernote and now Putler Connect. ABP and Dashlane work almost in the background. But they are always on. I use Evernote mostly to clip interesting articles. But Putler Connect has quickly become my most frequently used Chrome extension. Every time I summon it, and when it brings me customer data in a jiffy, a big smile pops on my face! Damnik, Malay and Chirag worked on building this extension with inputs from various other team members. I was talking to Damnik today morning and I asked him what he thinks is the coolest thing about this extension. He certainly has a point. And his twinkling eyes expressed his enthusiasm for how this little tool, an experiment for us actually, can help all Putler users. Install the Putler Connect browser extension! It’s super easy. Click the button below and install the extension. Once authenticated, click on the Putler icon in Chrome toolbar to open Putler Connect sidebar. Questions, suggestions and ideas welcome! We’ve spent a while making things work. But if something does not work, or if you have suggestions or ideas, reach out to us and let us know. And as always, thank you for being awesome!